As aortic stenosis can be progressive, even mild stenosis should be followed regularly until adulthood. Similarly, a bicuspid valve which may remain non-stenotic for decades, only to calcify and develop severe stenosis in the 6th to 7th decade of life. 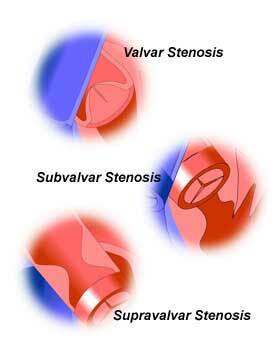 Symptoms of severe stenosis may include angina, labored breathing in response to exertion, or fainting (syncope). Some patients with a bicuspid aortic valve may also develop dilation (enlargement) of aorta. Balloon valvuloplasty is not effective in adults whose aortic valve leaflets have become calcified. One limiting factor to the success of balloon valvuloplasty is the careful balance between improving the opening of the valve without over-dilating the valve. Over-dilation of the valve can result in severe insufficiency. Nonetheless, balloon or surgical valvotomy (incision to improve the opening of the valve) always results in some degree of valve insufficiency. Moderate aortic insufficiency is poorly tolerated by the left ventricle and will likely result in aortic valve replacement. Even for patients who are treated with the valvotomy only, an aortic valve replacement will eventually become necessary because of calcification or valve regurgitation. The new valve may be expected to last for many years, depending on the age of the patient and the type of valve used, but it will eventually require replacement. The Ross repair will require reoperation as an adult as the prosthestic pulmonary valve will become progressively insufficient and adversely effect right ventricular function and often the neo-aortic valve becomes insufficient requiring prosthetic valve replacement of both the aortic and pulmonary valves. Becoming common in adults, especially those thought to be poor surgical candidates, is transcatheter aortic valve replacement.